Last week I acquired a pair of Calphalon "everyday" Santoku knives. I do much of our cooking, and I wanted a good knife to supplement a functional-but-not-great Cavalier set we got as a wedding present 22 years ago. I had seen the santoku variety of knives and was curious to try one. I was shopping for a gift for a holiday party and found a tremendous deal on the Calphalon set. It is clearly an entry level knife from them, and not part of their "Katana" series. Nevertheless, my initial uses of them tell me I will enjoy using them. But I created a problem. Worse, I created the sort of problem that ripples and creates a whole bunch of other little problems, sort of like cleaning one spot and having a noticeably clean spot in a larger are a that now clearly needs cleaning. My dilemma was that the knives I already had were neatly stored in a block. So where do I put two new knives that are sharp and have no sheaths? I pondered a half a dozen ideas, and all of them pointed out that where we kept the knife block, and two small cutting boards, and a marble holder for ladles and such, was on the back half of a great butcher-block work surface. We had over the years reduced our best work surface by more than 50 percent. I got rid of the marble holder and rearranged a few drawers to put those things away (not completely satisfactorily, mind you). I got rid of the stuff that had collected there over the years. All that was well and good, but I still did not have any place for the new knives! I explored those magnetic holders, but I did not have wall space upon which to mount one. It would have been cool to have a double-sided magnetic holder that would stick to the side of the fridge right above the butcher block work area, but there really is no such thing and people look at you funny when you describe what you want. At last I settled on shoving the 'fridge to the side (Oooooh! Cleanup in Aisle 2!) and screwed a board to the side of the butcher block surface with some 1/8" spacers. 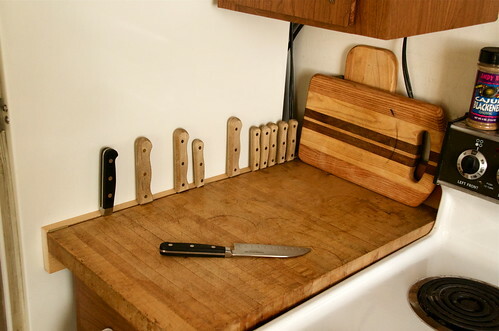 Now I had a very flexible knife block that held ALL of my knives right next to the optimal work surface which is now 95 percent available space. And I cleaned up and organized things that had not been cleaned and organized in far too long.